There have been very few books that I have read where the individual incapacitated by a devastating illness has not wallowed in self-pity or blamed others for their lot in life. “Live with Courage Lead with Hope” by Judy Cadorette is one of those books. It is the story of Michelle Cadorette, a young woman who spent the last fourteen years of her life in the hospital fighting cancer, yet at the same time, she was able to continue to provide love, support, and encouragement to those around her. She was a great model to all, and it makes us feel somewhat guilty when we whine about the smallest things. Written by her mother Judy, this book encompasses written thoughts from Michelle, her friends, family, and medical staff. Michelle shares memories of what she learned from her students, to things she will never be able to do again. Michelle was a gifted writer and English teacher. She came from a loving, solid family where everyone was accepted unconditionally, and constantly supported. You can see this reflected in her writings, shared in this book. Even though this is a story about Michelle’s battle with cancer and the many side effects, it really is about love, caring, and giving to others. Very few individuals will ever be able to match the courage and love of Michelle. She was a jokester with the medical staff; she had her down moments but always kept the big picture in mind. Regardless of what is going on with you, you can make it either positive or negative. Michelle chose the positive. I imagine that writing this book represented a couple of things for Michelle’s mother, one being therapeutic, and two, a wonderful memoir of her daughter’s true nature. It is written with such love and compassion. 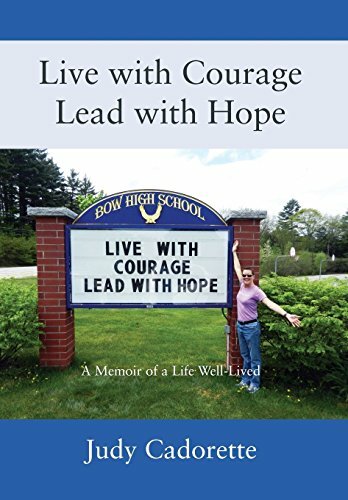 “Live with Courage Lead with Hope” by Judy Cadorette was so easy to read, readers will feel every emotion they have from sadness, to anger, to laughter and yet each reader will come out of this hopefully with a different perspective on their own lives.